Just purchased a brand new 55-300 PLM for use on my K3. Zoom out a little and the all is good, zoom back in and the same is displayed. Have remounted the lens, no difference. 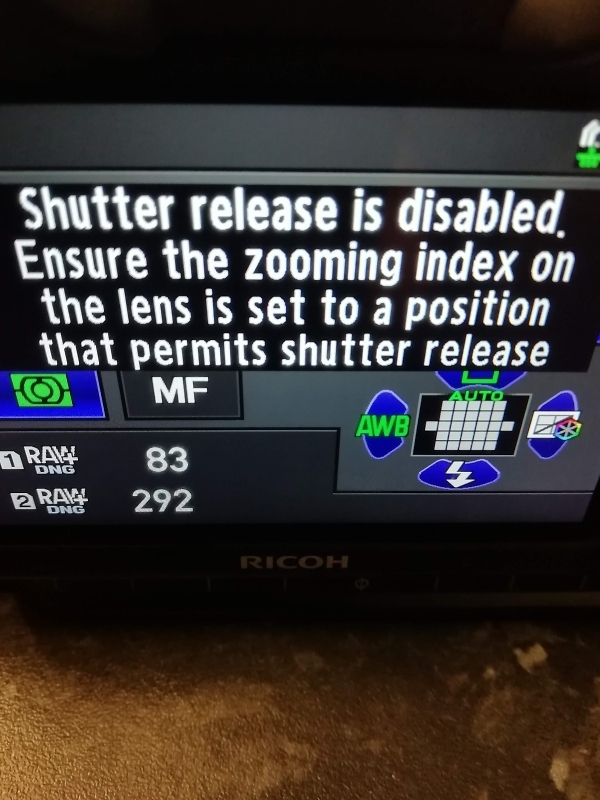 My understanding was that the K3 only required a firmware update for the 55-300 PLM to work. K5IIs, Sigma 10-20, Pentax DA 16-85, Pentax DA 55-300, Pentax 70 Ltd, Metz 44 AF-2. The lens has a position where it is shortened for more compact storage. Just click it out until it enters the place where zooming, and operation, can start. At least on Pentax Q lens does the same thing. It's intentional, not a fault. Every now and again a lens comes along that is frankly quite remarkable for the money; the 55/300 PLM is simply just that. Even more fun on my Nikon 1 kit lenses - it has a button you have to press to rotate the lens to a usable position. One good thing - if you do that while the cameras are off, it turns them on for you. And vice versa! With the Black Friday discount and trade in on my DA 55-300, this was cheaper than a used lens.